In this year... Best Picture was Rain Man..... TNT launched in the United States, becoming the fourth network owned by Turner Broadcasting..... Talk show host Geraldo Rivera's nose is broken during a taping of his show...The Wonder Years premieres on ABC..Red Dwarf debuts in the UK. No question...you have to watch A Fish Called Wanda. From one horror fan to another, I'd go with The Serpent & The Rainbow. Gotta agree with this^. Can't believe you've never seen this. It's hilarious! I am expecting this to be a long running thread... this isn't something I expect to zoom through. But I hope to keep plugging at it till the finish line at year 2011.... before the end of the year 2011. And both those movies were much... much better then The Hotel New Hampshire in my opinion. I have no doubt they are, I just saw a little bit of Hotel New Hampshire on a pay channel years ago and switch the channel very fast. Tour-de-force performances from an unparalleled comic cast highlight this much-loved hit that Roger Ebert calls "the funniest movie I have seen in a long time!" Monty Pythoners John Cleese and Michael Palin (Search For The Holy Grail, The Meaning Of Life) join Oscar® winner* Kevin Kline (In & Out) and Jamie Lee Curtis (True Lies) in an entertainment so impeccably timed and executed that Time Magazine hailed it as: "Genius – [a film that] redefines a great comic tradition!" Four conniving jewel thieves...three yorkshire terriers...two heaving bosoms and one proper British barrister. It all adds up to "a non-stop barrage of...outrageous plot twists and over-the top performances" (L.A. Weekly) when a girl called Wanda (Curtis) tries to deceive her Nietzche-quoting boyfriend (Kline), an animal-loving hitman (Palin) and an embarrassment-prone counselor (Cleese) out of a fortune in jewels in this hilariously funny farce! This is one I never seen before. Going into this one I was a little worried my expectations would be too high as I have always heard this is such a good movie. But thankfully I kept my expectations under control. I ended up enjoying this one quite a bit. It has some good laughs in it... and the entire cast did a great job. I especially enjoyed Jamie Lee Curtis and Michael Palin. This is one I would recommend anytime you are in the mood for just fun movie. And I want to thank all of you that recommended me to watch this one. In this year... "Batman" is released on June 23, and goes on to gross over $410 million worldwide..... This is the first year where all ten top grossing films worldwide made more than $100,000,000..... David Spade, and Mike Myers join the cast of Saturday Night Live...The Arsenio Hall Show (1989–1994) premieres in syndication. Yeah I know... I am going through these much faster then I thought I would. Some reason I just really been in the mood for movies lately. But you never know... that could change at any time! Casualties of War is an interesting one, Pete, though I recommend it only tentatively. Do you like war films, Vietnam themed in particular? Not my favorite of genres... but I can enjoy them when I am in the right mood. But too late for this time. I already have one of my favorite horror movies on for this year's choice. This is one of my all time favorite horror movies. As with most of the Stephen King movies... Stephen King himself has a cameo in the movie. This time as the preacher at the funeral for Mrs. Dandridge... the woman that helped the creed family in the beginning of the movie. This movie is one of the few movies that can make me cringe when watching it. actually from 2 things in the movie. First when Jud gets the back of his ankle sliced... the next when he is sliced across both cheeks when he is screaming. Both those look extremely painful to me. I couldn't even imagine. Not to mention.. this is a true horror movie for any parent. It even effected me... I had a time watching this movie when my daughter was about Gage's age... especially considering I live on a road that has a high school just down the street... you would not believe the way kids race up and down this road! There for the longest time I wouldn't even let my daughter play in the front yard at all! Anyway... This is just an awesome horror movie! So I definitely highly recommend it if by chance you never seen it before. 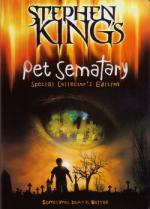 Please note that the above review for Pet Sematary is a recycled review... it does not need to be added to the list again. In this year... Future movie stars Chris Rock and Adam Sandler join SNL.... Tom Cruise and actress Nicole Kidman marry..... CBS starts airing its daytime lineup in stereo sound...Twin Peaks premieres on ABC.